Fancy Breakfast Friday: Happy New Year! I’m vacationing for New Years and I decided that I don’t want to leave my fancy camera in various parking lots at 10 or fewer degrees while I shred the mountain on my snowboard. (I use the term shred loosely.) So I don’t have access to the photos I took on Christmas morning of the fabulous breakfast that I made. (Reminder, #FBF is one week delayed.) Earlier in the week though, I did make this gingerbread dutch baby. It was pretty, but nothing to write a blog post about. For Christmas morning, I made the same scones I make every year. I make the scones ahead of time and freeze them, then they go straight in the oven at 375 and cook until browned and perfect. So yummy. Click here for the recipe. I also made a fritatta. On Christmas eve I microwaved some spinach (my recipe calls for “all the spinach that is about to go bad in your fridge.) I also sliced some onions and shredded some chedder cheese. In the morning, I sauteed the onions in olive oil, while I whisked about 6-8 eggs. I whisked in the cheese, spinach and some leftover choppped bacon. Once the skillet was heated up and the onions were softening, I poured the egg mixture in. i left the eggs on top of the stove until they no longer wiggled when I shook the pan, and the scones were done. Then I put them in the hot oven with the broiler on low. Presents were on the verge of being opened so I had to keep a close eye on everything. Scones, frittata, sausages, and bacon were served with milk, juice, coffee, and presents. Happy New Year Everyone! Here’s to some delicious breakfasts in 2016! 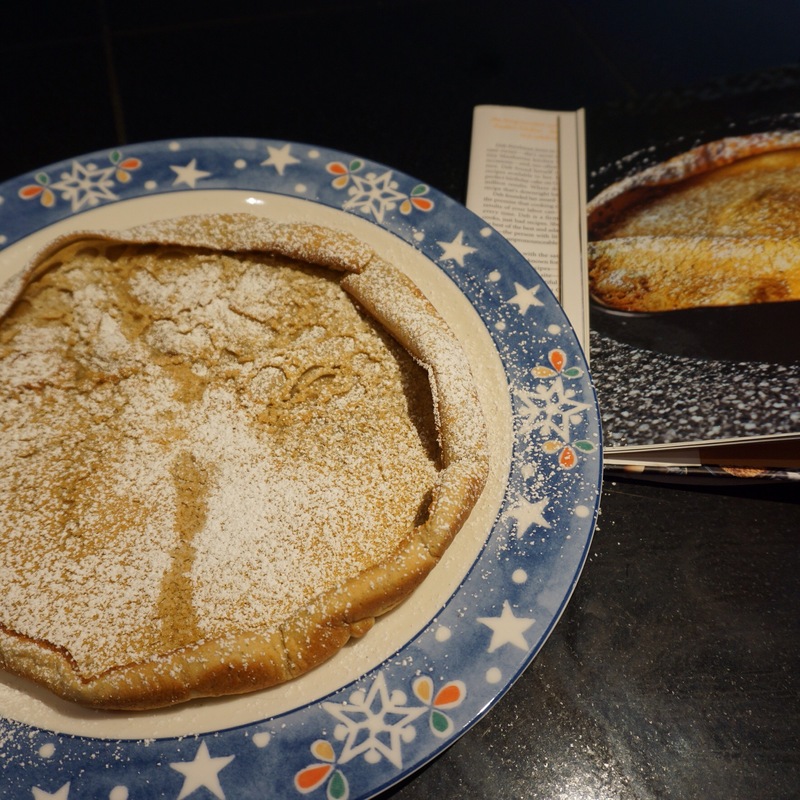 This entry was posted in food and tagged breakfast, dutch baby on January 1, 2016 by metamegan. And she did it seemingly without effort. Beautiful for Christmas morning. Nibble as you please all morning-and I did.